"Private Network Master" is a browser extension to route all the browser traffic through an external server. Basically, the extension looks for a configurable proxy server of type HTTP, HTTPS, SOCKS4, or SOCKS5 from two free proxy providers and set the returned proxy server to your browser to pass all your traffic through this proxy server. Note that only your browser traffic passes through the remote server, not your entire network traffic. You can configure the extension to find specific proxy servers with predefined properties such as the server type or whether the servers are anonymous or not. After a proxy server is found, the extension uses dyndns.org to verify if you are connected to the internet or not. If there was a problem in your connection, the extension resets the network configuration back to whatever it was before applying the proxy server and tries to find a new server until a reliable server is detected. In contrast to the other similar services, this extension only looks for free proxy servers, so there is no sever cost. What is the "Private Network Master" extension and how does it work? This extension relies on two free proxy server services to find you a reliable proxy server. When a proxy server is found based on the configuration user requested, the extension uses dyndns.org to check the external IP address and displays the result in the popup. 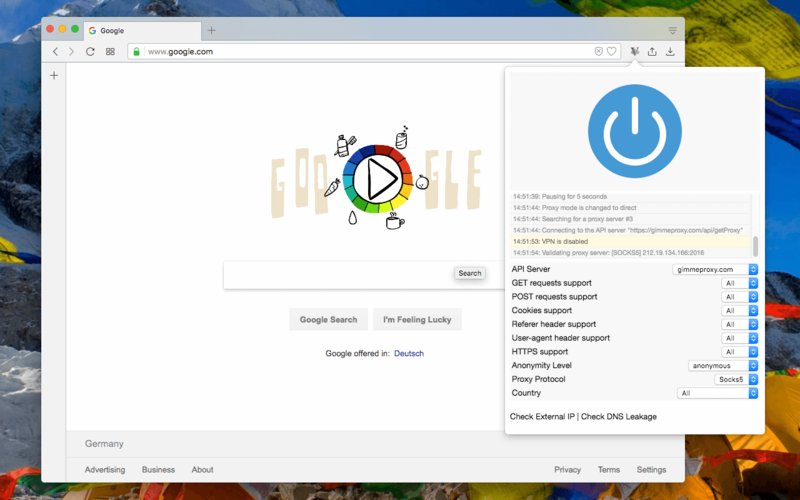 If your browser is connected to the internet, the toolbar icon changes to the colorful format. If not, the extension resets your network to connect directly to bypass all the system level proxy configurations. Then requests a new proxy server and then validates the newly set proxy server. This operation continues until a proxy server is found or maximum retries reach. What options do I have before requesting a new proxy server? How can I find my external IP address when I am connected to a remote server? In the popup, under the log section, your exit IP address is printed (the IP address that is seen by web servers). You can also use the two online services the extension provides at the bottom of the popup area. You can check the external IP address or whether there is a DNS leakage or not. What is the difference between HTTP and SOCKS servers? HTTP server cannot tunnel your DNS traffic, so your actual IP address can be revealed. Use the "DNS Tool" in the popup to make sure your DNS is not leaking. If anonymity is important for you it is recommended to use SOCKS5 servers. When I am using a transparent service, is it possible to find my actual location?